Warning: Font Find and Replace triggers routines in Helix RADE 6.2 that are not compatible with macOS 10.10 (Yosemite), resulting in a Helix RADE crash. This issue is addressed in Helix 7.0. Many of the standard fonts used in Classic Mac OS have been replaced by more modern counterparts. The default font, Geneva, has been replaced by Lucida Grande. Font Find and Replace is an AppleScript that automates the task of changing the use of one font to another. This script, while originally created to ease the transition from Classic to macOS, can also be used to make any font changes, from a single template to an entire collection. Font Find and Replace requires no AppleScript skills, but can be extended by experienced script writers. Start with a template open or selected in a relation window: just that template is affected. Start with a view open or selected in a relation window: just that view’s template is affected. Start with a relation open with no template selected: a selectable list of all templates is shown. Start with a relation open with multiple templates selected: a selectable list of all templates is shown, with the selected templates pre-highlighted. Start with the collection window open and no relations selected: a selectable list of all relations is shown. Start with the collection window open and one or more relations selected: a selectable list of all relations is shown with the selected relations pre-hilighted. Start with any other window open: a selectable list of all relations is shown. Note: in the selectable lists, use shift-click to select a range of items and command-click to select multiple distinct items. The user selects which is the font to be changed. Apple’s Font Book application is used to gather and display a list of available macOS fonts. The user specifies a basic (plain) replacement font. A dialog offers a choice to open every template checked, just templates modified, or to run without opening templates at all. After the script is completed, a dialog summarizes what just happened. 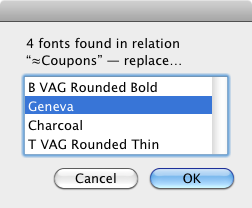 Canceling at any time during the font specification process stops the whole process. No change are made. Relations and templates are referenced by name. Duplicate names will cause unpredictable results. Some fonts can not be used as substitue fonts, due to naming discrepancies. For example, “Frutiger 55 Roman” is referred to internally as “R Frutiger Roman” and can not be matched. After switching to such a font, the Inspector will show ‘Lucida Grande’ (or your custom default font). This script does not change abaci that output styled text. This script does not alter styled text data that is stored in records. Jan 12, 2015: Version 1.1 is code signed, to avoid the difficulties running the applet in macOS 10.9 and later. Jun 23, 2015: Version 1.2 addresses an issue that causes the script to bypass all rectangles in some situations. Price: $27.00. Purchase through the web store. Helix® Code Exchange: Font Find and Replace. ©2014–2015 by QSA ToolWorks, LLC. All rights reserved.